Four wall units are completely stand-alone secure rooms that offer a protected space anywhere in your facility they will physically fit. WALLS: 4-wall units do not require connection to existing facility walls. They are freestanding. FLOORS: Partitions are designed to be anchored into a concrete floor. If your floor is uneven, or a surface that cannot hold anchors, contact us. Partitions can be installed on most any floor that can bear their weight, but there may be considerations with various floor surfaces. Contact us for assistance. Special footplates may be required for certain seismic zone areas. If you are in one of these areas, please let us know so we can configure your partition correctly. This may result in a pricing adjustment. 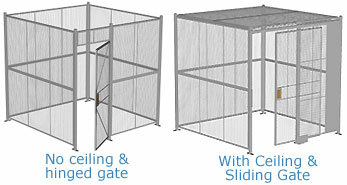 For assistance specifying your wire partition system, contact Cisco-Eagle customer service toll-free. We can help you design a unit exactly to your needs, including options not included in these standard units. For quote assistance on a 4-wall unit, submit this easy-to-use Quote/Configuration form.